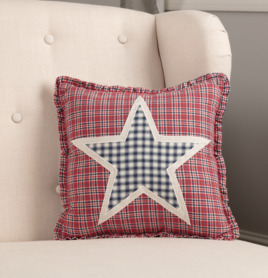 The Hatteras Flag Pillow compliments with red, white, & blue check, ticking stripes, & plaid in the form of a flag on a mixture of cotton, flax, & seersucker material. 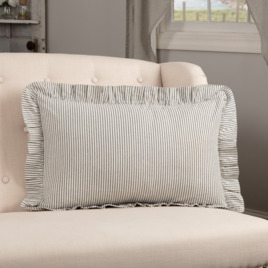 This decorative pillow reverses to blue and white ticking stripes with button closures. 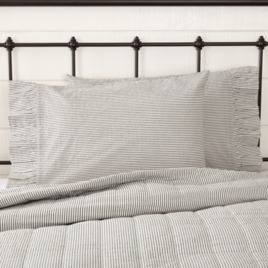 Add an Americana look to your bed with the Hatteras Patch Sham. 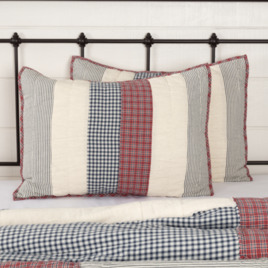 Featuring plaid, check, & popular ticking stripe patchwork in red, white, & blue. This patriotic quilt creates a lovely focal point for all your country, colonial decor. 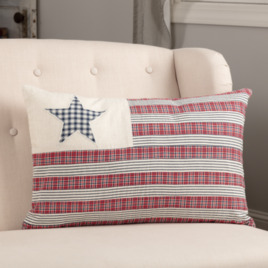 Enhance your patriotic decor & express your pride for love & country with the Hatteras Flag Pillow 14x22. 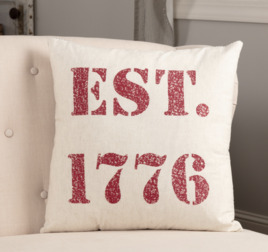 Featuring a cotton white background with distressed Americana red stenciling that says "est. 1776". Reverses to solid white with button closures. 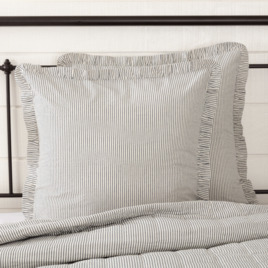 Freshen up your farmhouse style space with the Hatteras Seersucker Blue Ticking Stripe Fabric Pillow. Features denim blue & cotton white ticking stripes on seersucker material, perfect for your Americana, vintage style bedroom or living space. 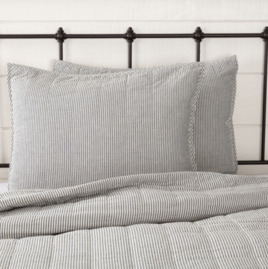 The Hatteras Seersucker Blue Ticking Stripe Fabric Euro Sham adds a cozy, refreshing look to your farmhouse style bedroom. A cool ocean breeze, vintage vibe featuring popular ticking stripes in denim blue & cotton white with quality seersucker material.